Birch + Butcher will be opening in The North End. Photo by Dave Reid. Kompali taqueria is coming to 1205 E. Brady St. in the former home of Cempazuchi. The full service taqueria hopes to open this September. For owners Karlos Soriano and Paco Villar, friendship is at the center of their business and lives. Soriano told Fredrich that all of their business decisions are based on compromise, friendship and love for their careers. The two hope to bring Taco Tuesdays to Brady Street through inspiration from C-Viche. Housemade blue-corn tortillas will be a signature feature for traditional tacos, including al pastor tacos made Mexico City style. The approach features pork roasted on the traditional trompo; a skewered pineapple set on top allows the fruit’s juices to fow down, mingling its flavor with the meat. There will also be tinga, based on a recipe handed down through Villar’s family who is from Hildago in Central Mexico. On the more chef-inspired side, traditional tortillas will sport modern ingredients like salmon teriyaki and C-Viche favorites like scallop, shrimp and fish tacos, along with tacos such as Argentine-style skirt steak marinated in chimichurri sauce. 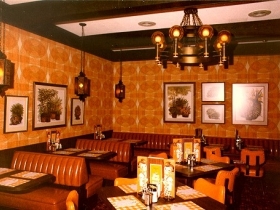 The menu will also offer vegetarian options, salsa, shareable appetizers and traditional sides. Kompali’s hours are expected to be 11 a.m. to midnight daily. The Italian restaurant Centro, in Riverwest, is getting a new bar next door. Bar Centro is expected to open in October at 804 E. Center St.
Peggy Karpfinger and Patrick Moore own both Centro and Bar Centro, and told Journal Sentinel’s Carol Deptolla the new addition will be based on a bar the two visited in Spain five years ago. “We feel like there’s a demand in the neighborhood to accommodate more people on Friday and Saturday nights especially,” Karpfinger Said. Karpfinger said customers would be able to put in their names at Bar Centro for tables and wait there until one opens. The bar is expected to be open Thursday through Saturday, and will hold private events, Centro’s wine classes and wine dinners on the other days. Drinks will be similar to those at Centro but will be more Italian-inspired. 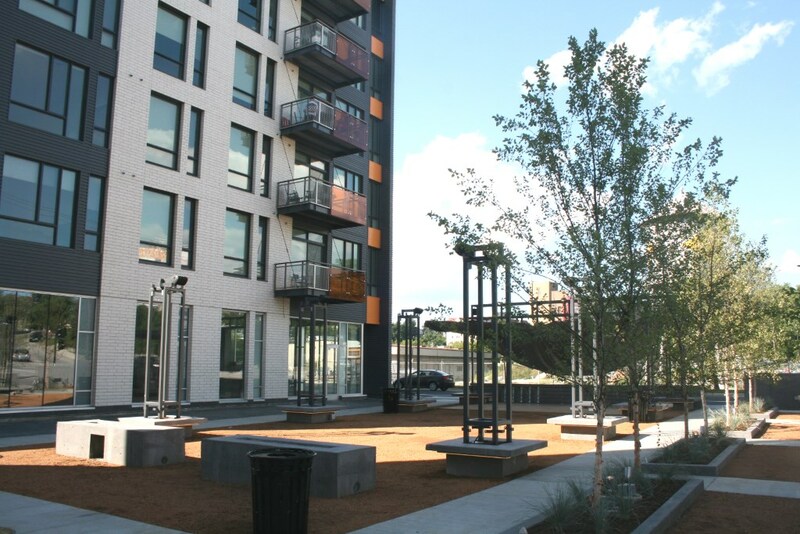 While the bar won’t have dining, food for events will be brought from Centro. Wood-fired cuisine and a butcher shop are coming to The North End, 459 E. Pleasant St., this September. According to OMC’s Lori Fredrich, Birch + Butcher will have an open kitchen that features an open wood-burning hearth as the focal point of the restaurant. She adds that 60 to 75% of the menu will touch the hearth before the meal makes it to your table. In fact, at its very core, Birch + Butcher is a concept that’s simultaneously forward-thinking and primal. It’s a place where locally-sourced foods, including meat and farm-fresh vegetables, are treated with care and respect as their flavors are harnessed and concentrated through the power of fire. Owner and chef Miles Borghgraef, who is opening the restaurant with his real-estate agent fiancee Rebecca Zwiefelhofer, left his position as chef de cuisine at Lake Park Bistro after two years to work on Birch + Butcher. The butcher half of the new digs will be adjacent to the restaurant and will be stocked with various items including domestic cheeses, sausages and meat butchered on site from local producers. Underground Meats in Madison will also contribute meats to the shop. The addition of an on-site butcher shop will allow Borghgraef to create delicious meals that are both fresh from the shop and affordable. Birch + Butcher is expected to be open daily from 7:30 or 8 a.m. through midnight, and on Sundays the restaurant will also be open for brunch from 8 a.m. to 4 p.m.
Marc’s Big Boy restaurants were an icon in Wisconsin since the first Marc’s Big Boy opened in Milwaukee in 1958 until the chain closed its doors. Those double-decker cheese burgers left your mouth watering. 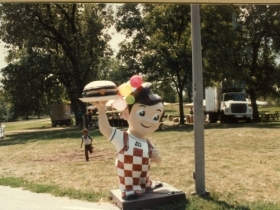 To the dismay of many, the last Wisconsin Marc’s Big Boy location closed in 1995, leaving many Big Boy lovers burger-less. 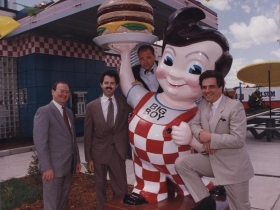 Big Boy fans fret no more: Big Boy is having a reunion. 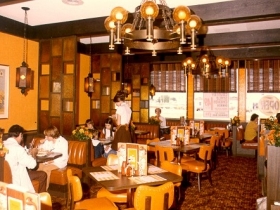 On Wednesday, August 9, head to Ovation Sarah Chudnow at 10995 N. Market St. in Mequon for a revival of Big Boy’s famous burgers. The $10 reservation-only dinner will feature the Big Boy Burger, onion rings, fries and strawberry pie. According to the Milwaukee Record, Steve and Greg Marcus will speak at the reunion. Dinner will start at 6 p.m. with the free celebration following at 7 p.m. To make reservations for dinner, call 262-478-1500. 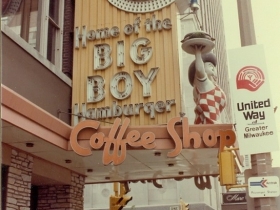 By the way, the Big Boy burger is still available in downtown Milwaukee, it’s on the lunch menu at Kil@wat, the restaurant located in the InterContinental Hotel, 139 E. Kilbourn Ave., Milwaukee. 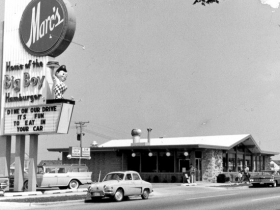 With Marcus’ heavy investment into restaurant-style food at their movie theaters, it would seem a natural for them to bring Big Boy hamburgers to those venues. What do you say, Steve and Greg? Make a Big Boy at home. Recipe here. Yay! Bring back Taco Tuesdays!